Over the last few years, both home and business users have felt the need to edit their office documents on the go, without resorting to local software. Many solutions have shun as winners providing this; Apple is now stepping up to the plate and bringing its iWork suite to the Web, under the form of iWork for iCloud. The new online suite aims at bringing all of the features from the desktop version of iWork into the cloud, offering full-featured online versions of Pages, Keynote and Numbers. Indeed, all of these apps allow users to modify uploaded documents, as well as create and manage documents straight from a web browser, removing the need to store documents locally altogether. Overall, the user experience provided by the Web apps seems to be as good as you would expect from desktop apps, save the consumption of extra memory and hard disc space. Documents can be loaded extremely quickly and edited very smoothly, all from a Web browser. Best yet, Apple seems to have not been picky as far as Web browsers, with the new online iWork suite designed to be compatible with any modern browser under the sun, including Safari, Chrome, Firefox and yes, even Internet Explorer. Some long-time Apple users may recall that Apple has tried launching an online iWork suite before; however, it was largely unsuccessful given the little effort that was placed into attracting new customers, and was soon discontinued. Since then, however, Apple has managed to revamp its online offering through iCloud. 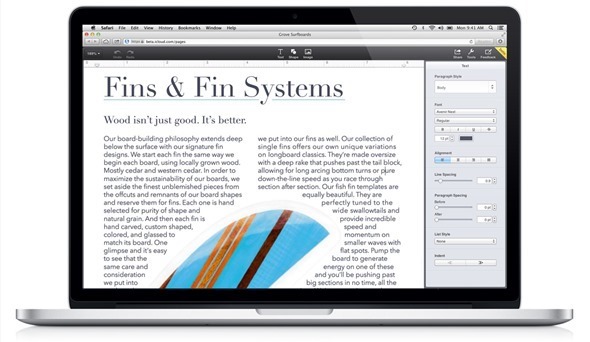 It may now be a much better time to give Apple’s online iWork suite a new look, especially as computer use moves further and further away from local storage. When should you expect to get your hands on this new online suite? If you have registered for an Apple Developer subscription, a Developer Preview will become available today, though be wary of the occasional glitch. Final versions of all three web apps are expected to become available to the public later this year. iWork for iCloud was unveiled at Apple’s Worldwide Developers Conference, which is taking place all week in San Francisco, California. Stay tuned with us for the latest announcements from this conference.